Darrell Colbert was originally a free agent pick up of the Kansas City Chiefs, and in 1987 was the only rookie to make the roster that season where he nabbed 4 catches in 15 games over the next two seasons. He’d catch a 40 yard bomb against the Oilers in the 1987 preseason, keying the Chiefs 32-20 victory. After being cut in 1988, Colbert would remain in shape, playing with the BC Lions and Edmonton Eskimos of the CFL in 1990. In 1992, he would be drafted by the San Antonio Riders of the WLAF who utilized him as a wide receiver and primary punt returner. Colbert would finish as the team’s leading receiver with 464 yards and second on the team with 33 receptions. (In the short history of the franchise, his 464 yards would be a team season record.) He’d also have the team’s longest play from scrimmage in 1992 with a 63 yard catch. The league would reorganize after the 1992 season. In 2010, Darrell was inducted into Texas Southern University’s Hall of Fame as an 80’s All-American inaugural member where he is the college’s all time leader in catches, yards, and receiving touchdowns. 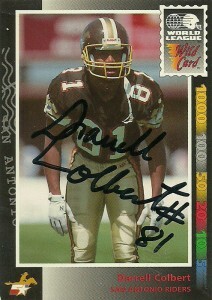 I tracked down Darrell outside of Waco, Tx recently, where he signed my card in roughly 12 days. Below are his statistics from the WLAF.